Vietnamese FPT Corp and German Siemens are expected to sign a strategic co-operation agreement on digital human resources training in July. Siemens president and CEO Joe Kaeser visited FPT’s F-Ville Software Village and FPT University during his first working visit of Viet Nam. The agreement will be signed on the occasion of the Vietnamese Prime Minister’s State-level visit to Germany, FPT chairman Truong Gia Binh said. 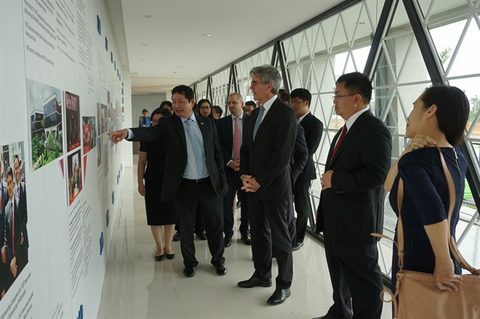 Siemens president and CEO Joe Kaeser visited FPT’s F-Ville Software Village and FPT University in Hoa Lac on Wednesday during his first working visit of Viet Nam. Joe Kaeser expressed his views on FPT’s digital transformation services and said he wished to co-operate with the Vietnamese corporation to implement Siemens’ digital solutions in FPT’s key markets. On this occasion, FPT also asked Siemens to set up an associate research and development laboratory for Viet Nam and Indochina, collaborate in training and developing workforces to deploy the cloud platform developed by Siemens (MindSphere) and pilot projects using MindSphere and Product Lifecycle Management (PLM) solutions from Siemens. Kaeser is responsible for the promotion of the forth industrial revolution in Germany and around the world, opening research labs on cloud computing and implementing digitised industrial resource programmes in Egypt, India, China and Singapore. Under his impetus, the fourth industrial revolution has been included in the German government’s weekly report.